The disciples saw where He lived and spent the day there with Him. Soon after this the Lord called Andrew and his brother Peter to follow after Him and told them that they were to become fishers of men unto the salvation of many. From that time forth, they remained with Christ; they were faithful to Him to the end and gave their very lives out of love for Him. Dear brothers and sisters on this day I would ask you the same question: What are you seeking? Why did you come to church today? What are we all seeking in our lives? Are we seeking Christ, as He was first sought by those humble fishermen, among who was the Apostle Andrew? We have to admit that most of us do not have Christ in our hearts. Instead, our hearts are occupied with that which is opposed to Christ -- our God and Saviour, that which is opposed to our own good, which hinders the salvation of our souls. And because of this we do not lead a genuine Christian life. What is it that occupies our hearts? God “alone, Who searchest out the hearts and reins” (Ps. 7:9), sees what is in our hearts, its attachments. If the Lord granted us to see the full depths of our hearts, we would turn our eyes away in horror from such an overwhelming accumulation of filth. Let each of us look into his heart and say before the witness of our conscience what it is that occupies our hearts most of all. 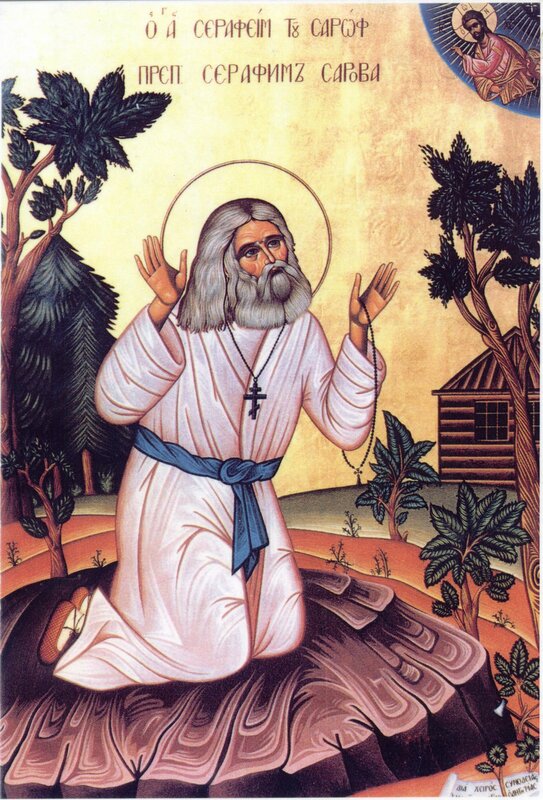 Having once embraced Christ, the holy Apostle Andrew became entirely committed to Him, and no matter what difficulties, sorrows, misfortunes and persecutions -- unavoidable in preaching the Gospel -- came his way, he remained faithful to Christ, enduring everything out of love for Him, even crucifixion. It is of utmost importance that we seek after Christ and that we find Him. Without Christ, who will save us from our sins which ensnare us every day and hour, and from the eternal torments? Only the Son of God has power on earth to forgive sins; He alone has the keys to hell and death, the keys to the Kingdom of Heaven and life. To find Christ is not difficult. He is everywhere, filling the world with Himself. God says to us through His prophet Jeremiah: “Am I a God at hand, saith the LORD, and not a God afar off?” (Jer. 23:23) As soon as He sees our hearts incline to receive His grace, He immediately enters, bringing with Him peace and comfort. “Behold, I stand at the door, and knock: if any man hear my voice, and open the door, I will come in to him, and will sup with him, and he with me” (Rev. 3:20), says the Lord. Oh, how often He converses with His faithful servants, as with true friends. Christ Himself is seeking you: if you but incline your heart toward Him, you will surely find Him. But how are we to know if we have found Christ and are close to Him? Those close to Christ often turn to Him in prayer with faith and love; they often pronounce from their heart His sweetest name, often call upon Him for help; they often read or listen to His word with childlike simplicity and love; they seek frequent union with Him in His life-giving Mysteries; they are satisfied with whatever they have and accepting of what happens to them; they strive according to their strength to fulfill Christ’s commandments... It happens that they also experience trials which are allowed by the loving Master, in order that their hearts be cleansed of every sinful impurity. Those who desire to be with Christ must not run away from trials, but even in times of joy, they must not forsake the carrying of their cross. My dear brothers and sisters! Seek Jesus Christ with faith and love. Do not forget that He gave His life on the Cross for our sakes, to deliver us from sin and eternal torment, and to dwell in our hearts, that we might have great joy. Do not forget, we have all been bought with the price of His blood, and we should belong to Him, as to our Redeemer. Our days are numbered. Every stroke of the clock reminds us to seek Him Who created time and Himself stands above the measure of time. He alone is able to pluck us out from the ravaging torrent of time... Every stroke of the clock tells us: Be watchful! You now have one hour less until you must cross the threshold into life after death which knows neither days nor hours. Do not be seduced by the momentary sweetness of sin which vanishes like a dream, leaving the soul empty, ailing, anguishing; it steals away precious time and ruins it forever. Do not waste time in useless occupations or idleness. Every one of you has a God-given talent to put to use. Busy yourselves in acquiring incorruptible wealth in the Kingdom of Heaven. Take the example of the thousands who have gone before you, having attained eternal rest and joy through their ceaseless labors in this temporal life, through sweat and tears. Make haste to uproot from yourselves sin in all its various manifestations, through the help of Christ the Saviour. Remember, man sows what he reaps (Gal. 6:7), according to the immutable law of God’s righteousness. While there is still time, therefore, let us hasten to find Christ and in faith create for Him an abode in our hearts that we not fall prey to the fire of gehenna, as it is written: “If a man abide not in me, he is cast forth as a branch, and is withered; and men gather them and cast them into the fire, and they are burned” (John 15:6). Amen. Once, during the period when the Patriarchate of Jerusalem was examining the life of St. Philoumenos before his canonization, a group of Romanian pilgrims was visiting the Church of St. Photini at the Well of Jacob in Nablus (Samaria). 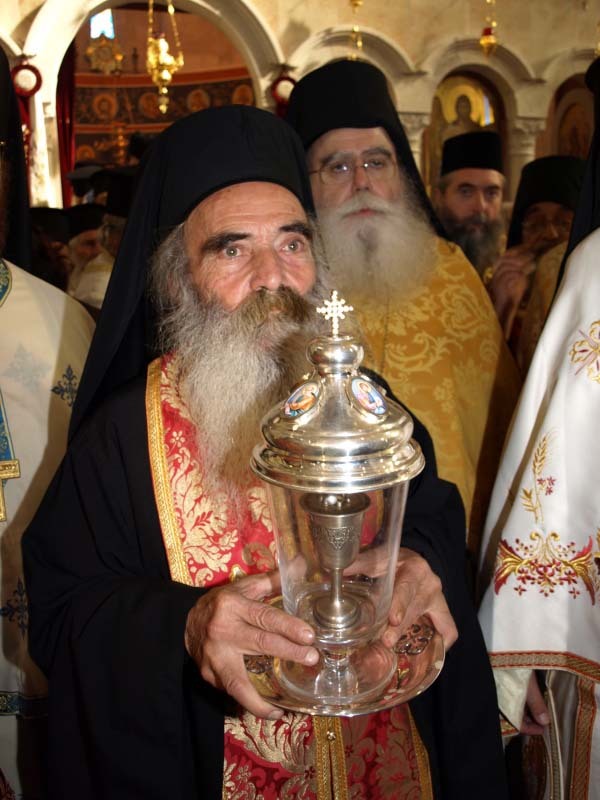 When they were venerating the holy, incorrupt Relic of St. Philoumenos, the whole party noticed a strong fragrance that permeated the whole church. At first, they assumed that the fragrance emitted from the Saint's Relic, but soon they, along with Fr. Justin (the current priest of the church and spiritual successor to St. Philoumenos at the Church of the Well of Jacob) acknowledged that it was coming from somewhere else. Following the aroma, Fr. Justin was led to the Skevophylakion of the church, where the church's various Holy Relics are kept. Soon, they realized that the source was a small silver cup. Fr. Justin said "I never brought this to the pilgrimage. In a paradoxical manner it was found there in the Skevophylakion, in a mysterious manner, inscrutably." "Cup with the martyrical blood which was shed on behalf of the house of the Lord, by the Holy Hieromartyr Philoumenos the Cypriot, November 16, 1979. The cup which I drink, may you drink." Metropolitan Neophytos goes on to explain how this is an astonishing and moving wonder, and that he feels that St. Philoumenos is a prophetic neomartyr, and that this message was meant for the whole Orthodox world of the modern era. We must all struggle, according to our strength, and give a true Christian witness. For some, this is a confession of faith, for some, this might be the shedding of our blood for Christ. Note: The following is an amateur translation from the Greek, and as such, I request reviewing the translation before any public/liturgical use. Also note that the meter of this translation is not set to match the original music. 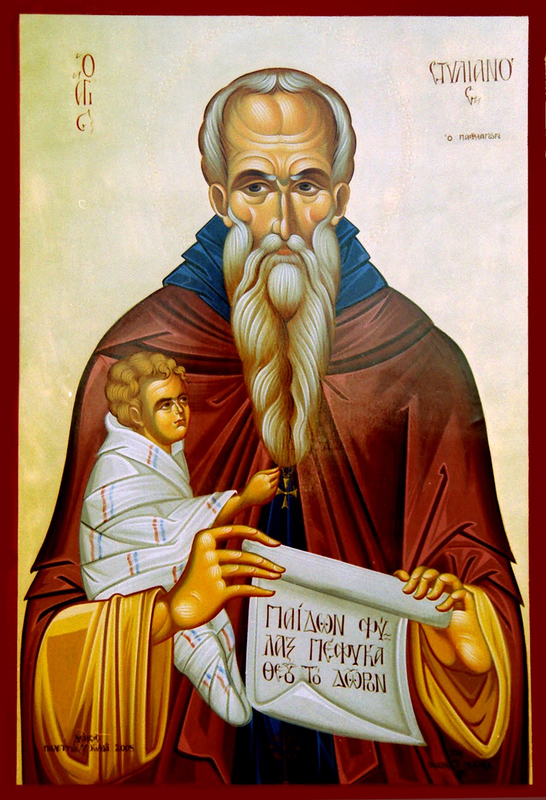 As a worker of God-given wonders, and a protector of the youth and infants, O Stylianos, our Father and healer of Christ, grant children to barren mothers, and ever cover newborn babes, for to you was richly granted grace from God, as you struggled for Him in asceticism as an angel. O Saint of God, intercede on our behalf. Dissolve, O Stylianos, the shackles of barrenness from those storm-tossed, through your fervent visitation, and entreat for the remission of their offenses. Extend, O Father, as one compassionate, your providence as far-shining rays, and invisibly enwrap and protect nursing babes, O Righteous one. Cease all infections and passions, and all distress and every affliction, and keep our children unharmed, O Stylianos, as a loving Father. Both now and ever, and unto the ages of ages. Amen. Theotokion. My strength and my song and my life, my joy and rejoicing, my guidance and protection, you are, O Virgin who held God, therefore ever protect me, O Spotless one. You are my help, O Stylianos, and the covering and physician of the newly-born. Therefore, deliver them. Who can recount your wonders, O Righteous Saint? For you ever deliver us from sicknesses and dangers. Water with the noetic water of your blessing, newborns, who entreat your grace, O God-bearer. Enlighten me, O All-spotless one, with the sweetest light of repentance, me who am in the night of unclean passions, through your all-powerful might. Deliver, O God-bearer Stylianos, those who entreat you from every danger and injury, and ever bless the newborn infants. A giver of many incorruptible gifts, you were shown to be, O Stylianos, through your divine strength, and you were revealed to be a perfect nourisher of babes, and a radiant guardian. Nourish and increase these mystically, with the milk of incorruptible goodness. Look down immaterially with your gladsome eye, upon all those gathered, and fill them with heavenly peace and gladness. Heal those in sickness, and lighten those burdened, O Righteous one, and dissipate the stench of the passions, as an inexhaustible spring of wonders. Your grace was shown to be a great protector of the youth and babes, therefore preserve them, O Stylianos, blessed by God. From your womb dawned the Sun of Righteousness, from Whose illumination, enlighten me, and guide me by His light. Invisibly visit, O Stylianos, these fragile babes and newborn roots, and protect them from every influence [of the evil one]. Grant healing and deliverance of souls and bodies, through the energy of your godly gifts, to those who hasten, O our Father, to your protection. Become my protector, and fervent deliverer. Through various trials, O Stylianos, you truly deliver me from dangers. Enlighten us through the radiance and noetic lightning of your greatness, O Mariam, blessed one, desired-of by the whole world. Your holy icon is beheld as a sun, lightning with noetic light, and with mystical rays, O God-bearer, ever keep the newborns warm, and wondrously quicken them and grant them graceful renewal. 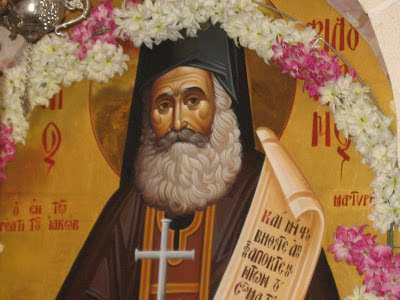 We have come to know you as a godly path of youth, and a true rod for old age, O Father Stylianos, we who are broken in soul cry to you: do not cease to guard and guide us towards better things. Make the newborn babes to have full and vibrant rejoicing, and be full of grace, through your providence, drive from them every gloom and illness and sadness, O compassionate one. Lift me up from the pit of evil, O Uplifted One, to the throne of the Creator, O Pure and Blessed Theotokos, towards noetic uplifting and grace, lifting up my soul, and cleanse me from dangers. The entreaty, followed by the Kontakion in the Second Tone. You are the inexhaustible spring of healings, and the most-fervent protector of infants, O blessed Stylianos, deliver from various dangers those who call upon your calling with fervor. Precious in the sight of the Lord is the death of His Righteous one. Verse: What shall I offer to the Lord, for all that He has given to us? Through the intercessions of Your Righteous one, O Merciful One, blot out the multitude of my offenses. Prosomoion in the Plagal of the Second Tone. 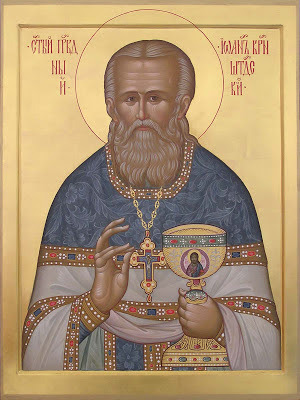 Hearken from above, O Father, to those who fervently entreat you, and who ask of your intercessions, and O Righteous one, heal babes and newborns from febrile illnesses, and grant them grace and health, as a most-compassionate one, that having received your God-given medicines, O Stylianos, you might magnify them to the true measure of age. Deliver from blights, besoiling infections and unclean passions, and every sadness and danger and frenzy, those who cry out and ever hymn you, O thrice-blessed Stylianos. As the defender of infants, you have been renewed, and a preserver of youth, and a healer of barrenness, making them to be fertile through Christ, O sacred Stylianos, through your radiant asceticism. Strange wonders, and a multitude of healings, and God-given gifts, springing-forth water, and quenching the furnace of wants and trials, and joyously renewing our minds. O Lady of calming countenance, auspiciously transform the sorrow of my soul and bitter anguish, into divine gladness, and hasten to deliver me, through your strong hand, delivering me from danger. Make fruitful, O Father, barren mothers, through your speedy intercessions, for they entreat you, pacing, with their whole souls, O Stylianos. Pour forth grace from your all-holy Icon, through the covering of the Spirit, O Father, and nourish and gladden newborns and infants. You appear angelic in form, whispering to motherly embracing, fill them, O Godly-minded one, with joy and laughter. Deliver me, O most-supremely Blessed One, from bodily and spiritual pains, through your coming, help me in dangers. Heal the sicknesses of nurslings, and whisper to children, O our Father, accepting their mothers' tears. You cause every child-corrupting danger to wilt, and keep the innocent ranks of children vibrant and thriving, O Father. O Stylianos, hasten to deliver me from the writ of my shame, and unhealable dangers from my evil habits and deeds, O God-bearer. Lift up, and hearken, O Full of Grace, to the groans from the depths of my soul, and do not disdain me, who am found in afflictions. 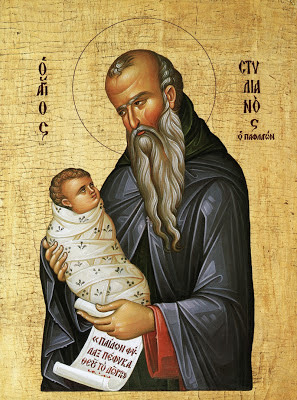 You were found to be sanctified from your mother's womb, as the glorious Samuel, and you were shown a true giver, through your virtuous life, O blessed Stylianos, to Him Who glorified you. Hail, O guide of continence, and divine adornment of dispassion, hail the type of the Righteous in asceticism, O Stylianos, equal to the Angels. O God-bearer, you are a protector and preserver and provider for newborns, and children and infants, through the divine inbreathing: deliver them from every influence [of the evil one]. Behold, and hearken to the groans of mothers, O godly-minded one, who have taken refuge in you, and hasten to deliver their children from the frenzy of the enemy, O thrice-blessed Stylianos. As vibrant and joyous flowers, beautiful in appearance and innocent in manner, O wise one, invisibly keep our children, O all-blessed Stylianos, for those who praise you. Having boldness before Christ, O thrice-blessed Righteous one, do not cease to entreat for those who ask for your aid, that we be delivered from every danger. A living monument of self restraint, an immovable pillar of the Church you were shown to be, blessed Stylianos, for you were dedicated to God from your youth, and were seen as a dwelling place of the Spirit. Holy Father, entreat Christ our God, to grant us His great mercy. You have been shown a great guide and protector of children and infants and babes, and a true physician, through the Grace of the Spirit. 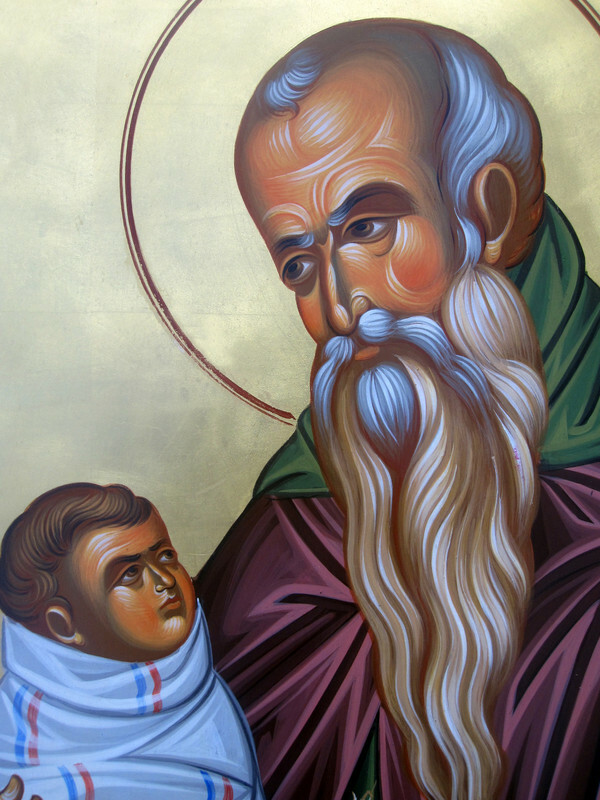 Deliver newborns from weaknesses and afflictions, and various illnesses, keeping them unharmed, and blessing them and speaking to them, that they grow up well, O Stylianos, blessed by God. Through the prayers of our Holy Fathers, Lord Jesus Christ our God, have mercy on u and save us! Amen! "This ever-memorable daughter of the earthly ruler of Alexandria, Konstas (Kestou), was tall in stature, incomparably beautiful, and exceedingly kind. She was instructed in the wisdom of the Greeks, learning all the works of the poets and philosophers, including Homer, Virgil, Aristotle, and Plato. Not only was she well-versed in philosophy, but in the medical writings of Aesculapius, Hippocrates, and Galen. Indeed, the maiden was a master of all the nuances of many languages, surpassing all others in rhetoric and logic. All who saw and heard Catherine marvelled at her scholarship. Many of the wealthy and leading men of the Senate besought Catherine's mother for her hand in marriage. Now her mother was a Christian in secret, because of the great persecutions brought about by the followers of Maximian. Both the maiden's relatives and mother counseled her to marry, so that her father's estate would not fall to another, thus cutting her off altogether. Now Catherine, on account of her many philosophical studies, cherished her viriginity and protested, giving many excuses, for she had no wish whatsoever to wed. However, when she saw that they troubled her greatly over the matter, she proposed the following--actually to divert them--so as not to be further importuned. "Present unto me a young man who is like unto me in the four virtues in which you claim that I am peerless among women, and I will take him as my husband, for I will not condescend to be yoked to one who is unworthy or inferior. Therefore, search here and abroad for one who is equal to me in rank, wealth, wisdom, and beauty--if such an individual exists. Furthermore, if he is deficient in any of these areas, he is unsuitable." Now they knew that it would be quite impossible to find such a qualified suitor. They suggested the son of the Roman emperor and other possible candidates of exalted rank and even greater wealth, but they were inferior to her in the categories of erudition and appearance. She stubbornly persisted in her refusal to contract a marriage with an unlettered man. However, her mother had a most holy spiritual confessor who was in hiding outside the city limits. She took her daughter to visit the elder to seek his counsel. The ascetic, perceiving her modesty and proper deportment, gave close attention to her judicious and well-spoken words. He resolved to bring her to the knowledge of Christ the heavenly King, and began, saying: If I am acquainted with a unique Man Who incomparably transcendeth all those attributes thou hast mentioned and countless others. His comeliness eclipseth the radiance of the sun; His wisdom governeth those things both perceptible by the sense and the intelligence; the world of His treasures is distributed to the ends of the earth, yet never diminisheth, rather increases; His nobility is indescribable, infinite, inconceivable, and incomprehensible! The venerable elder expounded on this many other salutary things. Now the maiden presumed all the while that he referred to an earthly prince; whereupon, her expression changed and she questioned him in detail if all the commendations and praises were indeed true concerning this Man. He reinforced his praises further, extolling His other attributes. The maiden asked: "Whose Son is this Man whom thou dost laud?" He asserted: "He hath no father on earth, but was born of a most noble and holy grace-filled virgin in a manner surpassing our understanding and transcending the nature of generation; she was deemed worthy by her sublime sanctity to remain immortal both in soul and body, being assumed to the highest heavens, wherein our Lady is venerated by the holy angels as Queen of all creation." Further interested, Catherine continued: "Is it possible to see the Youth?" The old man responded: "If thou wilt do as I say, thou shalt be deemed worthy to behold the radiant splendor of His splendid countenance!" Catherine replied: "I perceive thee to be a faithful witness and a venerable elder. I believe all thou hast revealed to me; therefore, I am prepared to follow thine instructions implicitly." 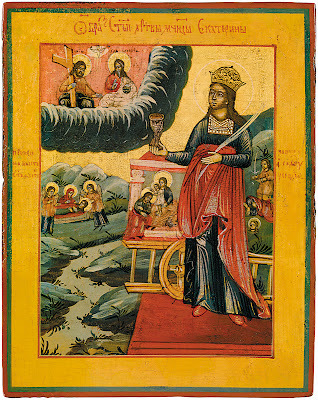 Then, the ascetic gave her an icon depicting the most holy Theotokos holding the divine Child. He then called to Catherine's attention: "This is the Ever-virgin Mother of the One Whose wonders I have extolled . Take this sacred image and close the door to thy bedchamber; pray all night with profound reverence to her whose name is Mary. Implore her to condescend to reveal her Son and, I believe, if thou wilt pray with faith, she will hearken and show to thee Him Whom thy soul desireth." The maiden then took the holy icon and returned to the palace. She closed herself in her inner room as the elder directed. From the tremendous effort exerted in her supplications, she fell asleep and beheld in a vision the Queen of the angels, as portrayed in the icon, holding the holy Child, Whose Person emitted rays more radiant than the sun; yet His face was turned towards His Mother. Thus, Catherine saw His back only. She yearned to behold His countenance, and so went to the other side; but once again He turned His face away. This happened thrice. She then heard the most holy Mother say: "My Child, look upon Thine handmaiden Catherine! How beautiful and comely she is!" But He answered: "Nay, rather she is somber and so repugnant that it is not possible for Me to look upon her!" The most holy Theotokos continued: "Is she not more wise than all the orators, wealthy, and the most elegant in all the cities?" But Christ replied: "My Mother, I tell thee that she is ignorant, poor, and contemptible! Whosoever is in like condition, I do not wish to look upon!" Again, the Theotokos spoke: "I beg Thee, my sweet Child, despise not the work of Thy Hands! But, advise and guide her as to what she should do, so as to have a share of Thy glory and behold Thy face resplendent with light, which the angels long to gaze upon!" Christ then said: "She should go to the elder who gave her the icon. Whatever instructions he giveth, she should do. Then, when she desireth to see, she will receive joy and benefit." Having beheld this vision, she awoke and pondered deeply on the matter. In the morning, she hastened with a few other women to the elder's cell. Falling at his feet in tears, she related the vision and implored him to advise her how to proceed, that she might attain her heart's desire. The blessed one explained in detail the sacraments and mysteries of our true Faith, commencing with the the creation of the universe and the making of man. He catechized her thoroughly as to the Second Coming of our Lord Christ and the ineffable glory of paradise in contrast to the all-grievous and neverending torments. Intelligent and quick of mind, Catherine grasped, within a short period of time, all the fine points of the Faith. She believed with all her heart and was received into the Faith through holy baptism at his hands. Afterwards, he instructed her to entreat the most Holy Theotokos to appear once again. 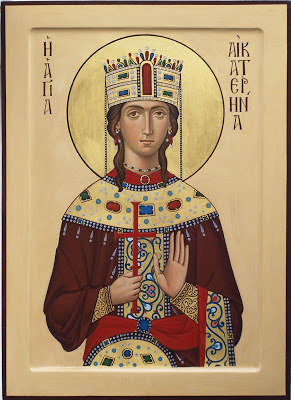 The holy maiden, having thus put off the "old man" and put on a garment woven by God, went to the palace and kept vigil all night, fasting and praying with tears. Finally sleep overcame her, and she beheld the heavenly Queen with the divine Child, Who looked upon Catherine with a gracious eye. This time the Mother of God inquired of the Master Christ if the virgin pleased Him. Our Lord answered: "She who was formerly unillumined and unsightly is now resplendent and glorious to behold! The poor and ignorant one hath become wealthy and enlightened; the contemptible and undistinguished hath become noble and eminent, possessed now of so many good blessings and graces that I am well-disposed and desire to betrothe her to Myself as Mine undefiled bride!" At that moment, catherine fell prostrate weeping: "0 exceeding glorious Lord, I am unworthy to look upon Thee! Make me worthy to be numbered among Thy servants! " The Theotokos then took the right hand of the maiden and said: "My Child, give her a ring as a token of Thy betrothal to her, so as to deem her worthy of Thy Kingdom." The Master Christ then gave her a beautiful ring, saying: "Behold, this day I take thee as Mine unsullied bride forever. Diligently preserve this troth inviolate, taking no man to thyself!" And with these words the vision came to an end. Catherine arose and, verily, a ring was on her right finger! At that moment, her heart was enraptured with the divine love of our Lord Christ." 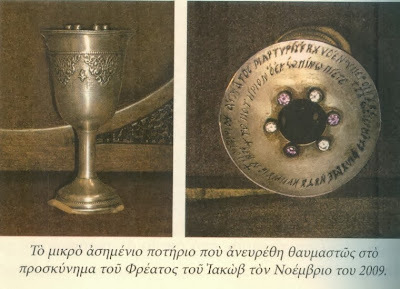 "The marble chest containing the relics of Saint Catherine is located at the south side of the sanctuary in the catholicon of the holy monastery. It is the construction of Procopius the stonecutter, who took nine years to complete the shrine in honor of Saint Catherine. This shrine replaced the earlier marble chest, which is preserved today in the monastery’s treasury. Inside are to be found two precious reliquaries given by the Russian Empire for this purpose, the one enshrining the precious head of the martyr, and the other her left hand. 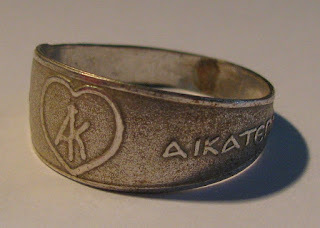 The relics of Saint Catherine are brought out for the veneration of the faithful on special occasions, at which time each pilgrim is given a silver ring bearing the monogram of the saint, in honor of the ring that Saint Catherine received from Christ. These are preserved by pilgrims as a blessing from the saint." Outside the village there was, on a small hill, a chapel of St. Paraskevi. Elder Iakovos would go there regularly when he was young, to pray to the Saint. “With my hands I dug the soul and created a make-shift staircase, so pilgrims could go without difficulty to the chapel. I cut a fluffy bush, swept the church, lit the vigil lamps, and sat and gazed at the icons, in the total silence of the night on the deserted hill. I was neither afraid on my own, nor did I ever have cowardly thoughts. I then saw the Saint as nun coming out of the Holy Altar, crossing through her church and out into the yard, and to bend and clean her vigil lamps. 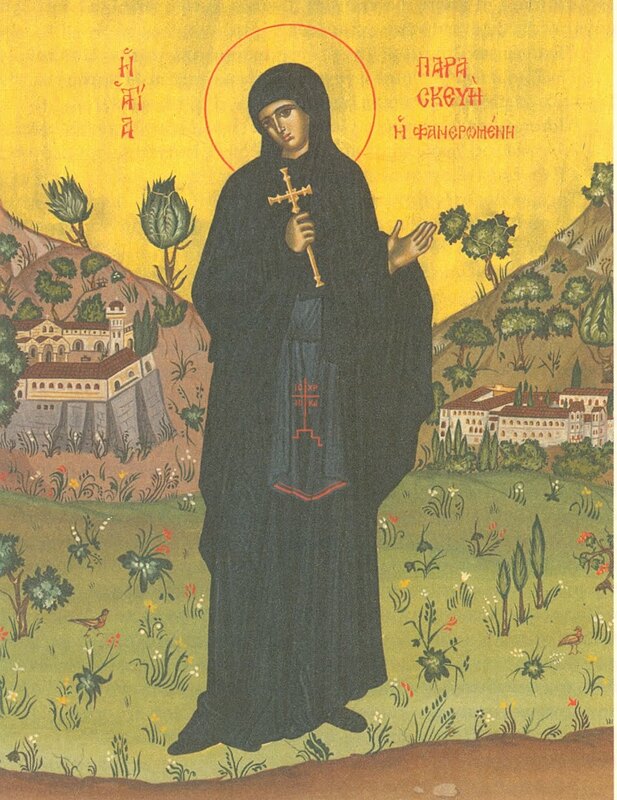 With my childish mind I said that the Saint was cleaning her plates, just like my mother did every evening, no matter how tired she was (for she thought what if she died during the night, and in the morning the women find dirty dishes, and be scandalized for the absent homemaker). Having this thought in my mind, I thought that the Saint cleaned her plates at night, too. “Let me go ask my mother.” And immediately I turned around and fled running for my home. I told my mother that I saw St. Paraskevi and she asked me to tell her what gift I want from her. “You saw St. Paraskevi, my child? How did you see her? What happened exactly?” my mother asked. St. Paisios Velichkovsky: "Labor for virtue according to your strength..."
“Virtue is acquired by every kind of forcing oneself. Therefore, if you wish to conquer the passions, cut off the love of pleasure; but if you are pursuing food, you will spend a life in passions; the soul will not be humbled if the flesh is not deprived of bread. It is not possible to deliver the soul from perdition while protecting the body from unpleasantness. Therefore let us return to what is primary. If you wish to be saved, O my soul, to go first on the most sorrowful path which has been indicated here, to enter into the Heavenly Kingdom and receive eternal life – then refine your flesh, taste voluntary bitterness, and endure difficult sorrows, as all the Saints tasted and endured. And when a man is preparing himself and gives himself the command to endure for the sake of God all sorrows and pain which come upon him, then light and painless seem for him all sorrows, unpleasantnesses and attacks of devils and men. He does not fear death, and nothing can separate such a one from the love of Christ. Have you heard, my beloved soul, how the Holy Fathers spent their lives? O my soul! Imitate them at least a little. Did they not have tears? O woe, my soul. Were they not sorrowful, thin and worn out in body? O woe, my soul. Did they not have bodily illnesses, great wounds and lamentation of soul with tears? O woe, my soul. Were they not clothed in the same infirm body that we have? O woe, my soul! Did they not have the desire for splendid, sweet and light repose in this world and every bodily repose? Yes, they desired these things, and their bodies in truth were afflicted, but they exchanged their desires for patience and their grief for future joy. They cut off everything once and for all. They considered themselves as dead men, and tormented themselves mercilessly in spiritual labors. Do you see, my soul, how the Holy Fathers labored, having no repose and suffering every kind of evil? They subjected the flesh to the spirit and fulfilled all the other commandments of God, and were saved. But you, O pitiful soul, do not at all wish to force yourself, and you grow faint from small labors, grow despondent and do not at all remember the hour of death and weep over your sins; but you have become accustomed, my wretched soul, to eat to the fill, to drink to the fill and to be slothful. Do you not know that you are called voluntarily to torment? And yet you endure nothing. How then do you wish to be saved? At least from this time forth, then: Arise, my beloved soul, and do what I shall tell you. During the forty day period prior to the celebration of the Nativity of our Lord*** it is a tradition for priests to celebrate daily the Divine Liturgy. The Forty Liturgies celebrated during this time are a great blessing not only for those who participate, but also for those commemorated among both the living and reposed. As St. Ignatius of Antioch writes: "Take heed, then, often to come together to give thanks to God, and show forth His praise. For when you assemble frequently in the same place, the powers of Satan are destroyed, and the destruction at which he aims is prevented by the unity of your faith" (Eph. 13). The power of the Divine Liturgy isn't magical, but it is a manifestation of love and unity in Christ. It teaches us to forgive, to have love for one another, and to be united in Christ as one body. In such an assembly, where the living and reposed are commemorated, great blessings follow for all. The Divine Forty Day Liturgies of the Nativity season on behalf of the living and reposed are a manifestation of the love we should have for one another as members of the Church. Nothing makes more real and present the love of Christ for mankind, who took on flesh for the salvation of sinners, then the daily offering of the Divine Eucharist for the forgiveness of sins and life everlasting of the living and reposed. As St. John of Kronstadt writes: "In the Divine Liturgy is celebrated the Mystery of Love...[O perfect love! O love which embraces all! O strongest love! What can we offer in thanksgiving to God for His love for us? This love is found in the sacrifice of Christ, which is offered for the liberation of all from every evil...]"
And Elder Paisios advised regarding the need to pray for the departed: "Leave in your prayers room for the reposed. The dead can do nothing for themselves. The living can. Bring to the church prosphoro, and give the names of the reposed to be commemorated by the priest in the proskomede. Do also memorials and trisagia. But the trisagion without the Divine Liturgy is nothing. The greatest thing we can do for someone is Forty Liturgies. It would be good to tie it in together with almsgiving." 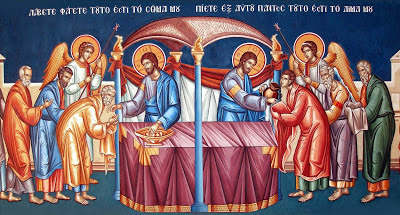 St. Symeon of Thessaloniki writes of the commemoration of the reposed during the Divine Liturgy: "During the Liturgy their portion which is placed on the diskos invisibly partakes of God, they are cleansed through the Sacred Blood and commune,...and they are consoled...and they rejoice in Christ." And St. John Chrysostom writes: "You should not have any doubt whatsoever that the dead will benefit spiritually. The priest does not plead in vain in the Holy Prothesis or at the Holy Table for the reposed in Christ, with faith in the God-man Lord." ***Note: There are many places which also celebrate the Forty Divine Liturgies at other periods of the year (e.g. 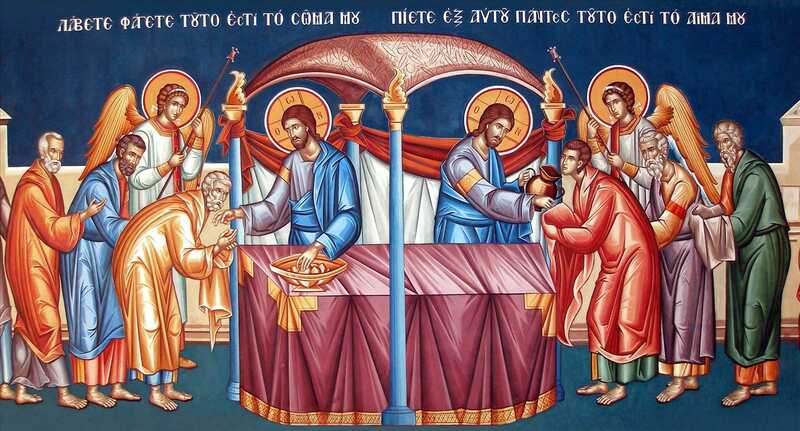 during the forty days after Pascha), while there are other places which, through the grace of God, celebrate the Divine Liturgy every day, for the healing, forgiveness and sanctification of the faithful. 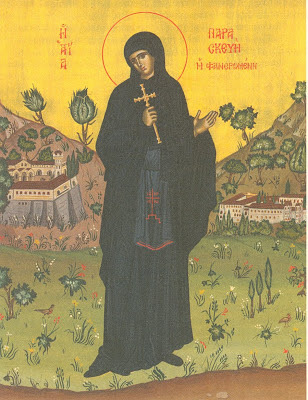 Elder Daniel of Katounakia (+1929) was originally from Smyrna, and at one point while he was a monk on Mount Athos he lived at Vatopaidi Monastery. One of his obediences was to travel on business for Vatopaidi to Smyrna where he stayed for nine months. When Elder Daniel was a young boy in Smyrna, there was a simple Christian named Demetrios, who was known for his great virtue and piety, that would counsel and admonish him with heavenly wisdom. Upon his return to Smyrna the elder had heard that Demetrios was dead and he wished to meet with Demetrios' son George to ask him about it. He writes: "As soon as I arrived, I considered it my inviolable duty to first of all visit George, the son of the ever-memorable Demetrios. I questioned him minutely about the death of his father, of whose repose I had heard from many people." George described the details of his virtuous father's death to Elder Daniel with tears in his eyes, yet one event was so remarkable that Elder Daniel decided to record it for our spiritual benefit. Reaching the sunset of his earthly life, the divinely-enlightened Demetrios knew beforehand, by the grace of God, the day of his death. On that day he asked a certain devout, guileless, and saintly priest, Fr. 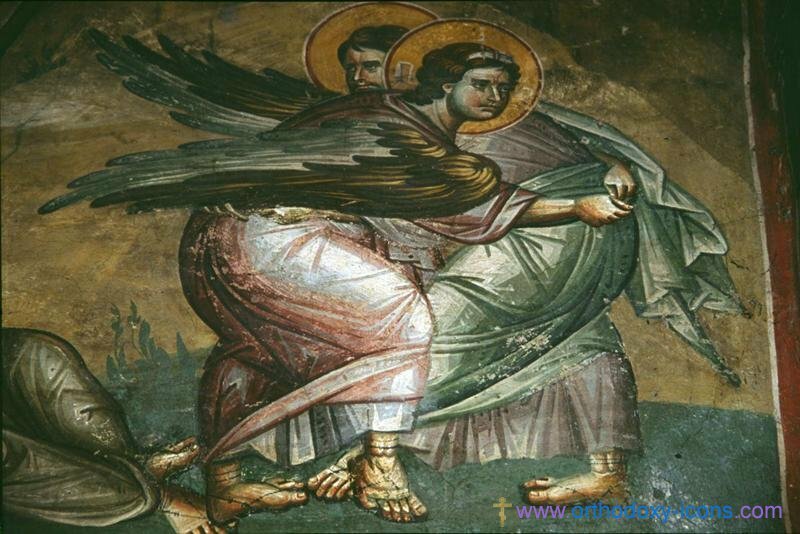 Demetrios, to come to him. "I will die today, my father," he said to him. "I beg you, tell me what I must do at this critical time." "If you wish, give a command that after your death forty Liturgies should be served for you in a country chapel." The dying man accepted the priest's suggestion with joy. A little while later he called his son. "My son, I ask one favor. I ask that after my death you arrange to have forty Liturgies served for me in some church far away from the city." "Give me your blessing, Father, and I will promise you to fulfill your wish," was the reply. After two hours the man of God gave up his spirit. Without delay, his good son addressed Fr. Demetrios, not knowing it was he who had suggested the forty Liturgies. "Fr. Demetrios, my father left me a command to have forty Liturgies served for him somewhere outside the city. As you sometimes stay at the Chapel of the Holy Apostles, i beg you to take on the labor of serving them. I will take care of your work and the expenses of the church." With tears the priest replied: "My dear George, I myself gave this advice to your father, and I will always commemorate him as long as I live. I cannot serve a regular forty Liturgies, however, because right now my presvytera is a little sick. You will have to entrust them to another priest." "I must serve forty Liturgies for the soul of the good Christian Demetrios. Therefore don't expect me home for forty days. I will be at the Holy Apostles the whole time." He began willingly to serve the Liturgies. Thirty-nine went by without hindrance, and the last was to fall on a Sunday. On Saturday evening, however, he was seized by a terrible toothache which forced him to return home. He was moaning from the pain. His presvytera suggested that they call someone to extract the painful tooth. "No," he answered, "I have to serve the last Liturgy tomorrow." In the middle of the night, however, the pain grew so great that they were forced to summon a specialist to pull the decayed tooth. As he was bleeding, he decided to serve the last Liturgy on Monday. On Saturday afternoon, George got some money ready to repay the labor of the priest, which he would give him the next day. In the middle of the night, as Sunday was approaching, he arose to pray. The absolute silence of the night was conducive to compunction. Later, growing tired, he sat on his bed and began to recall to his mind the virtues, gifts and wise words of his blessed father. The thought also passed through his mind: "Do the forty Liturgies really benefit the soul of the reposed, or does the Church mainly recommend them for the consolation of the living?" Just at that moment he fell into a light sleep. He saw himself in a beautiful plain, of an indescribable loveliness one does not see the earth. He felt himself unworthy to be in such a holy paradisiacal place, however, and was overcome by fear, afraid that because of his unworthiness he would be cast out from there and thrust into the depth of hades. But the thought strengthened him: "Since the All-Good God deigned to bring me here, He will have mercy on me and lead me to repentance, for since I am still in my body I must still be living." After this consoling thought he saw from afar a most pure and clear light, shining much brighter than the sun. He ran towards it and saw with unspeakable surprise a sight of indescribable beauty. Before him stretched a vast forest-garden, all wooded, fragrant with a wonderful and unutterable aroma. He said within himself: "This must be Paradise! Oh, what blessedness awaits those who live virtuously on the earth!" Examining this other-worldly beauty with astonishment and delight, he saw a most beautiful palace of exceeding brightness and excelling architectural grace, whose walls shone more than gold and diamonds. It was impossible to describe it beauty in human terms, and he was speechless and amazed. Drawing closer - oh joy! He saw his father, light-bearing and shining, before the door of the palace. "How did you come here, my child?" his father asked him with gentleness and love. "I don't know either, Father. I realize that I am not worthy of this place. But tell me, how are you here? How did you come here? Whose palace is this?" "The goodness of our Savior Christ, by the intercession of the Mother of God, whom I especially revere, vouchsafed me this place. I was to have entered into the palace today, but since the builder who is constructing it is suffering from bad health - he had his tooth extracted today - the forty days of its building have not been completed. Therefore I will enter it tomorrow." After those words George awoke, full of tears and wonder, but also with some perplexities. For the remainder of the night he did not sleep, but sent up continuous praise and glorification to the All-Good God. In the morning he went to attend Liturgy at the Cathedral of St. Photini. Afterwards he took with him prosphora, blessed wine, and an unburnt candle and set out for the region of Mirtakia, where the Chapel of the Holy Apostles was located. He found Fr. Demetrios sitting in a chair inside his cell. The priest welcomed him with joy, saying: "I also have just come from Divine Liturgy. Now the forty Liturgies are finished." This he said so as not to grieve George. "My dear George, I am the builder who worked at constructing the palace. Today I did not serve Liturgy because I had my tooth extracted. See, the handkerchief in my hand is stained with blood. I told you a falsehood because I didn't want to sadden you." Elder Daniel was deeply moved by this blessed narrative. At the end, George urged him to visit Fr. Demetrios, who at that time was working as a priest in the district of St. John the Theologian. The priest told him exactly the same story, and begged him to record such a profitable tale. This is what happened, as we found it among his manuscripts. At the end of it, Elder Daniel noted with his pen: "The above account I heard in the year 1875, in the month of October. This ever-memorable Demetrios reposed in 1869." 1. When he would Liturgize he would become another man. Those attending church would hear various sounds from the Holy Altar from his heavenly visitors. They would kneel and chant "Lord have mercy". 2. One day the Saint said to his chanter: "I had so many saints today that I didn't have enough room to fit them. 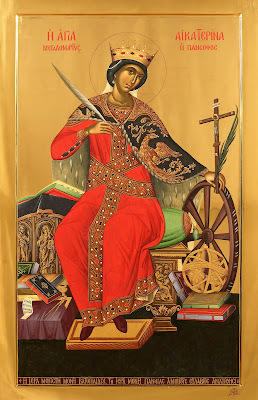 We put Saint Panteleimon in one corner, because there was no room." 3. At one time demons bothered the Saint and would not allow him to do the proskomede. After the Liturgy he said: "I began these Forty Liturgies with stress. The demons would yell out the names so that I would not be able to commemorate them, and thus not allow them to be forgiven." "Elder, were you tired to finish them?" "No my child. It was a pleasure for me, as if I did one Vespers, because they were very good people. Your father had a rich table like Abraham." Then the man thought: "We were so poor, to the point we were hungry, so where did our father find such a rich table?" "Don't see things like that," the Saint corrected. "Maybe he did not have to give, but his soul wanted to give much, and God accounted it to him as if he did give it. Your mother is a servant of your father, because she was very tiresome and would sadden him, always complaining to him. But your father always wore a smile with much goodness. Among your relatives you had a blind girl, whom you forgot to write. She was pure and very good." "But how did you know this?" asked the man in wonder. "When I commemorate, she also comes to the kollyva, but she comes as a guest, and does not unite with the others. Now everyone went to their place and opened the road for you."